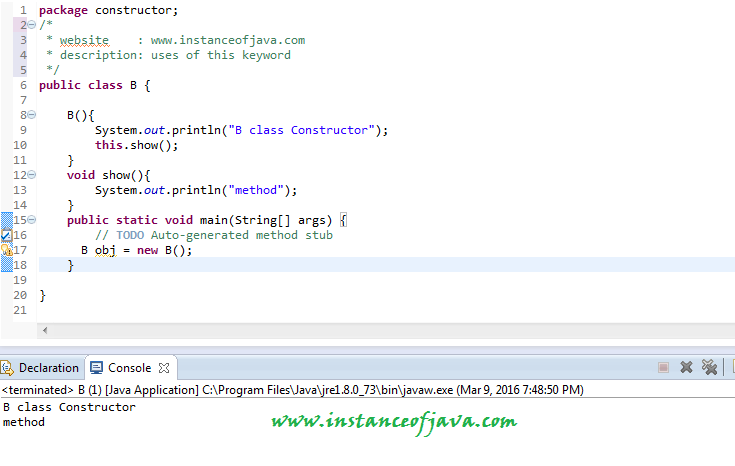 1.What is this key word in java? 2.What are the uses of this keyword in constructor? 1.this must be used to access instance variable if both instance and local variable names are same. We can use this keyword in constructor overloading. To call one constructor from another we need this(); and this(); call should be first statement of the constructor. 3. Can we call methods using this keyword? 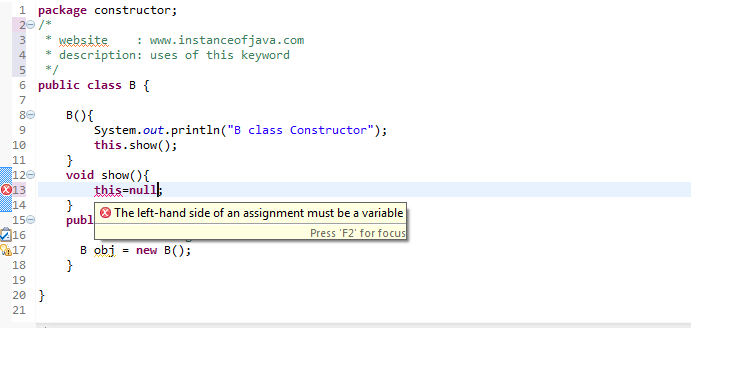 Yes we can use this keyword to call current class non static methods . 3. Can we call method on this keyword from constructor? 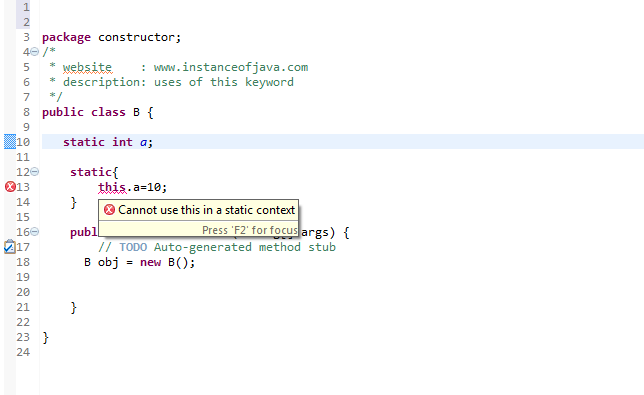 Yes we can call non static methods from constructor using this keyword. 4.Is it possible to assign reference to this ? No we can not assign any value to "this" because its always points to current object and it is a final reference in java. If we try to change or assign value to this compile time error will come. 5.Can we return this from a method? 6.Can we pass this as parameter of method? 7. Can we use this to refer static members? Yes its possible to access static variable of a class using this but its discouraged and as per best practices this should be used on non static reference. 8.Is it possible to use this in static blocks? No its not possible to use this keyword in static block. 9.Can we use this in static methods? 10.What are all the differences between this and super keyword? Using this we can access all non static methods and variables. Using super we can access super class variable and methods from sub class. Using this(); call we can call other constructor in same class. Using super we can call super class constructor from sub class constructor. its very nicely described..Thank you so much . Great work.. Thanks a lot!! Superbly explained, specially by programming.